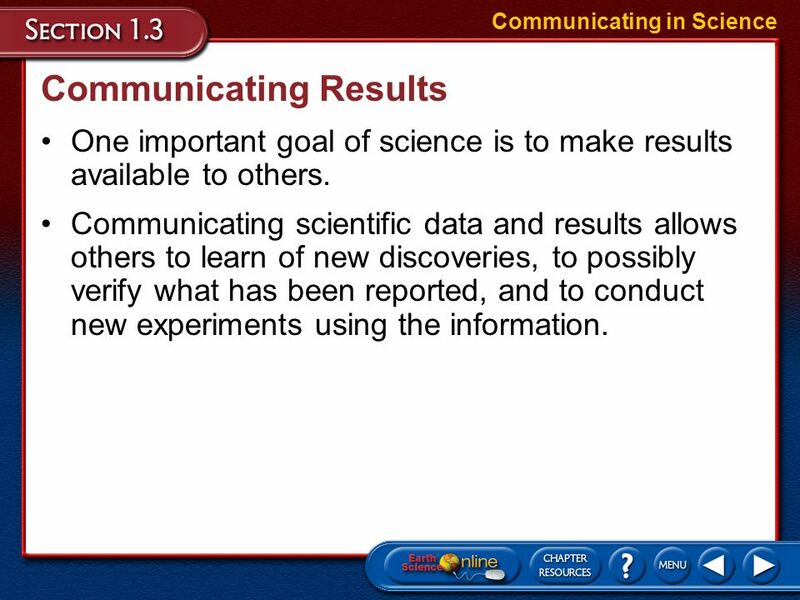 Communicating in Science Communicating Results One important goal of science is to make results available to others. Communicating scientific data and results allows others to learn of new discoveries, to possibly verify what has been reported, and to conduct new experiments using the information. 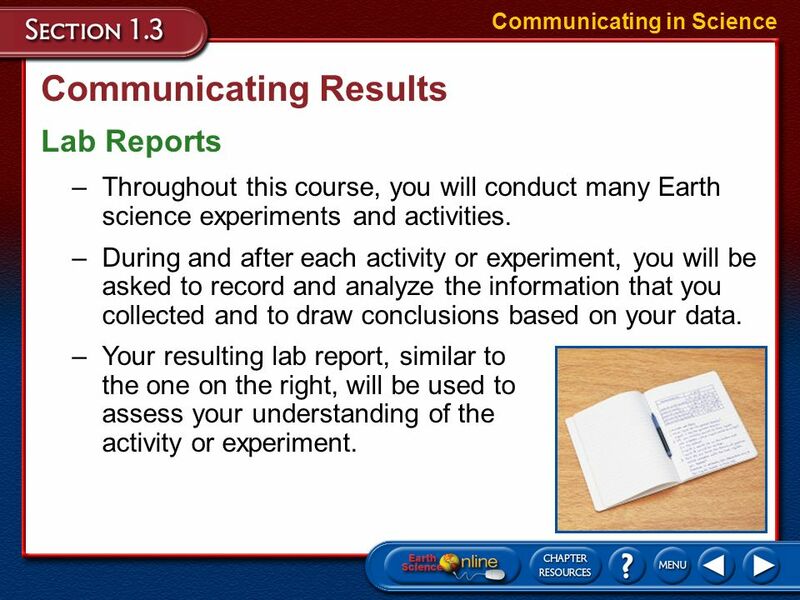 Communicating in Science Communicating Results Lab Reports Throughout this course, you will conduct many Earth science experiments and activities. During and after each activity or experiment, you will be asked to record and analyze the information that you collected and to draw conclusions based on your data. Your resulting lab report, similar to the one on the right, will be used to assess your understanding of the activity or experiment. 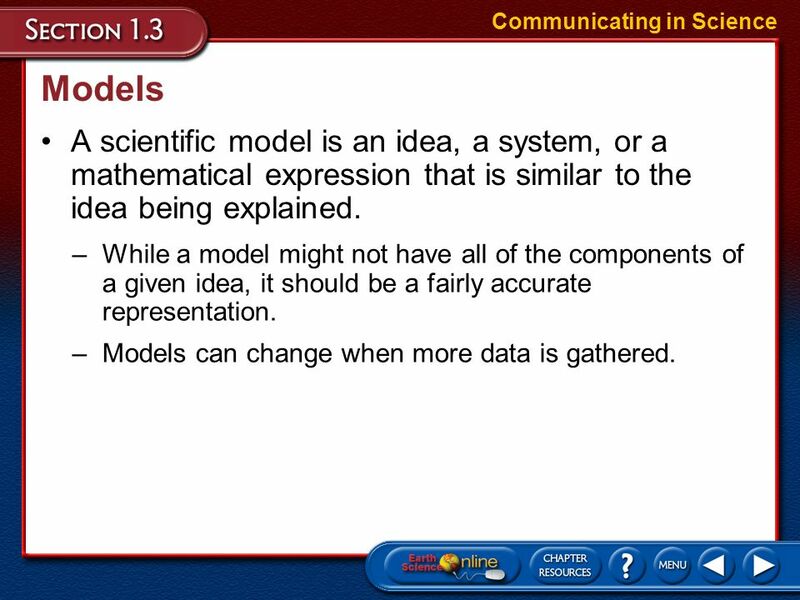 Models A scientific model is an idea, a system, or a mathematical expression that is similar to the idea being explained. While a model might not have all of the components of a given idea, it should be a fairly accurate representation. Models can change when more data is gathered. 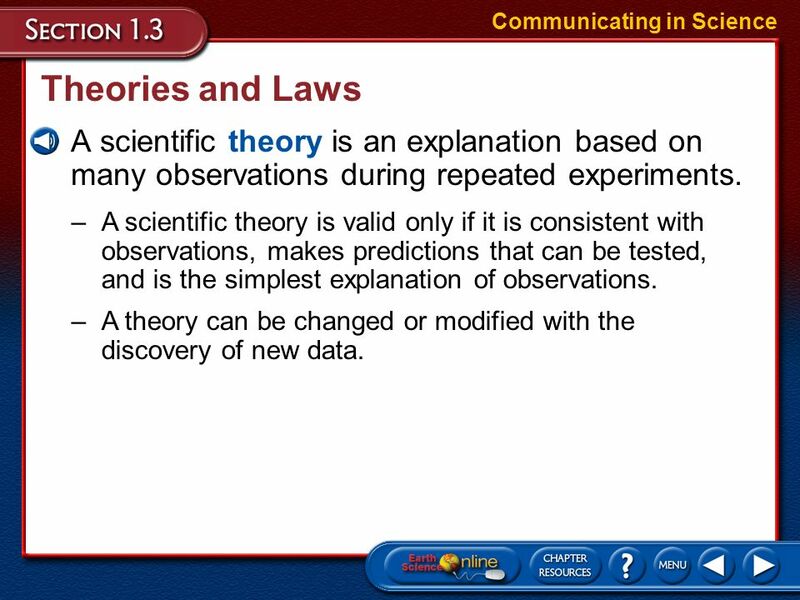 Theories and Laws A scientific theory is an explanation based on many observations during repeated experiments. A scientific theory is valid only if it is consistent with observations, makes predictions that can be tested, and is the simplest explanation of observations. A theory can be changed or modified with the discovery of new data. 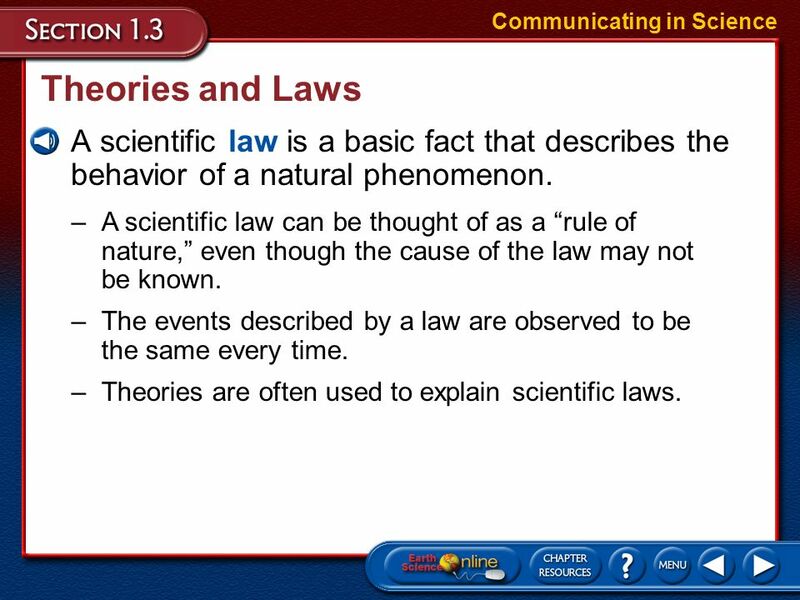 Theories and Laws A scientific law is a basic fact that describes the behavior of a natural phenomenon. A scientific law can be thought of as a “rule of nature,” even though the cause of the law may not be known. The events described by a law are observed to be the same every time. Theories are often used to explain scientific laws. 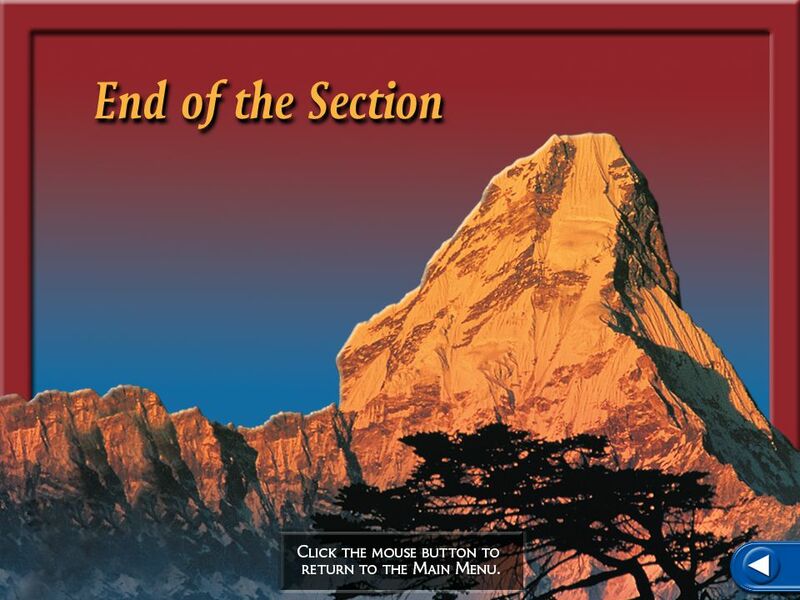 Section Assessment 2. On a line graph, what is plotted on the horizontal (x) axis? The independent variable is plotted on the horizontal (x) axis. 3. 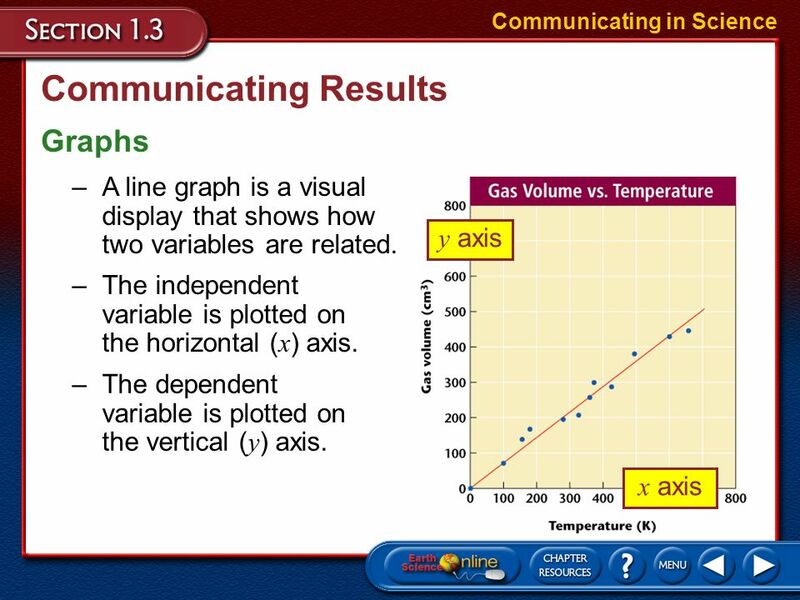 On a line graph, what is plotted on the vertical (y) axis? The dependent variable is plotted on the vertical (y) axis. There are four major areas in Earth science. Astronomy is the study of objects beyond Earth’s atmosphere. Meteorology is the branch of Earth science that deals with Earth’s atmosphere. The study of the materials that make up Earth and the processes that form and change these materials is known as geology. The study of Earth’s oceans is called oceanography. Earth can be divided into four main systems. The lithosphere includes the rocks that make up the crust and rigid, upper mantle. The atmosphere is the blanket of gases that surrounds Earth. Earth’s hydrosphere is the system of all of the water on the planet. The biosphere is Earth’s inhabitants and their environments. All of Earth’s systems interact. You are part of the biosphere and you live on the crust, which is part of the lithosphere. You breathe the gases in that atmosphere and depend in many ways on the water in the hydrosphere. The order of steps in a scientific method can vary. Most scientific methods to solving a problem, however, include defining the problem, stating a hypothesis, testing the hypothesis, analyzing the results of the test, and drawing conclusions. Variables are factors that change in an experiment. A dependent variable can change in response to changes in the independent variable. A control is a standard for comparison. 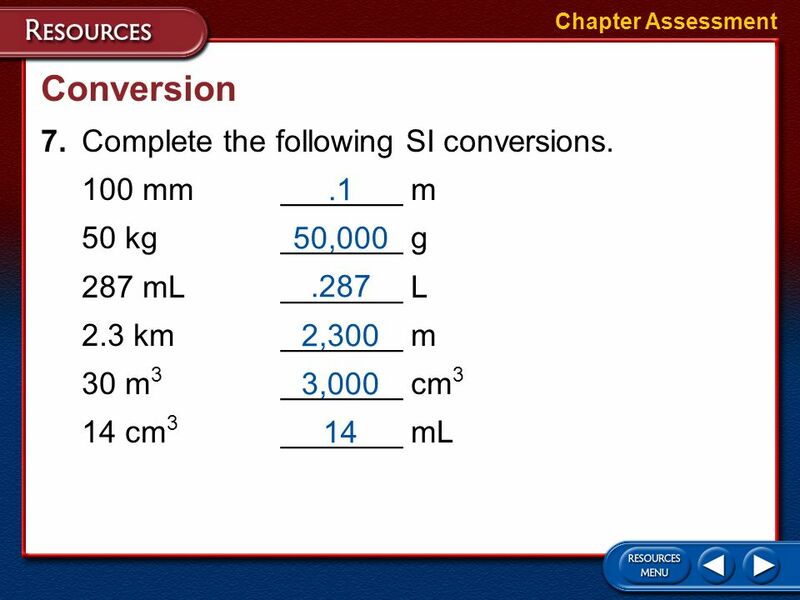 Basic units used in SI include the liter, the meter, the second, the kilogram, the Newton, and degrees Celsius. In scientific notation, a number is expressed as a multiplier and a power of 10. 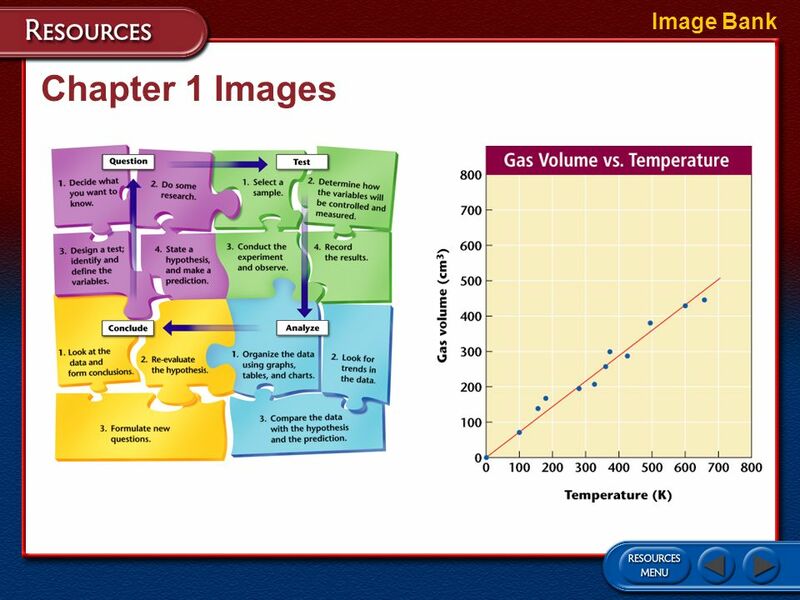 Scientific information is communicated through lab reports, professional papers, tables and graphs, and models. A scientific theory is an explanation based on many observations during repeated experiments. A scientific theory is valid only if it is consistent with observations, makes predictions that can be tested, and is the simplest explanation of observations. A theory can be changed or modified if it is found to be incorrect. A scientific law is a basic fact that describes the behavior of a natural phenomenon. A scientific law can be thought of as a “rule of nature,” even though the cause of the law may not be known. 15 Chapter Assessment Multiple Choice 1. Which branch of Earth science studies the air that surrounds our planet? a.	astronomy	c.	geology b.	meteorology	d.	oceanography Astronomy is the study of objects beyond Earth’s atmosphere; geology is the study of the materials that make up Earth and the processes that form and change these materials; and oceanography is the study of Earth’s oceans. 16 Chapter Assessment Multiple Choice 2. 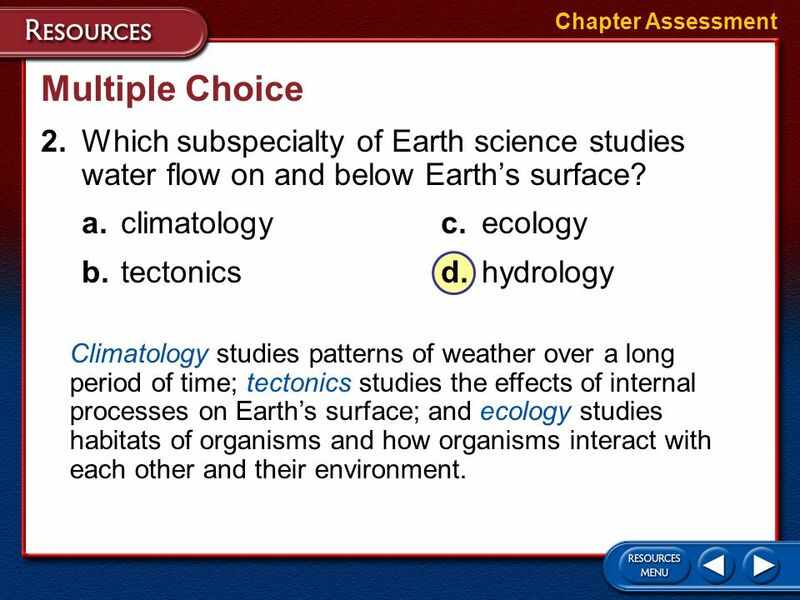 Which subspecialty of Earth science studies water flow on and below Earth’s surface? a.	climatology	c.	ecology b.	tectonics	d.	hydrology Climatology studies patterns of weather over a long period of time; tectonics studies the effects of internal processes on Earth’s surface; and ecology studies habitats of organisms and how organisms interact with each other and their environment. 17 Multiple Choice 3. 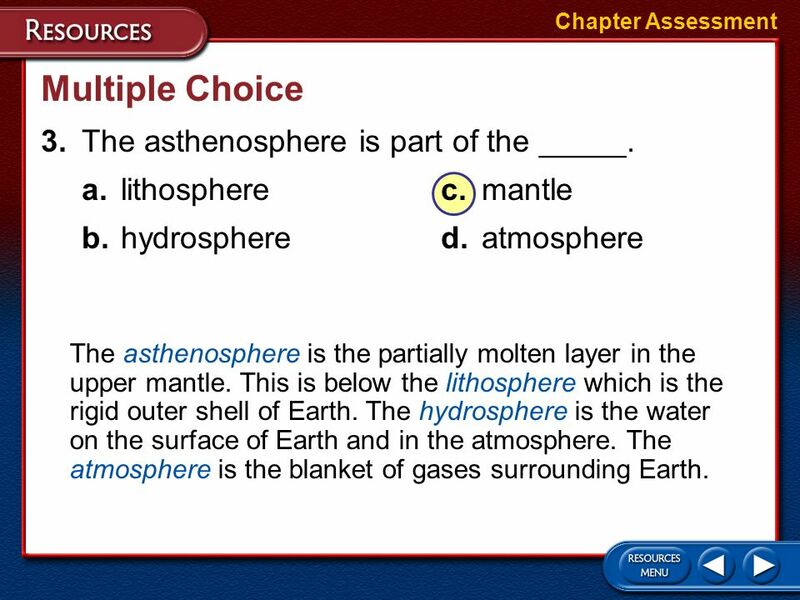 The asthenosphere is part of the _____. 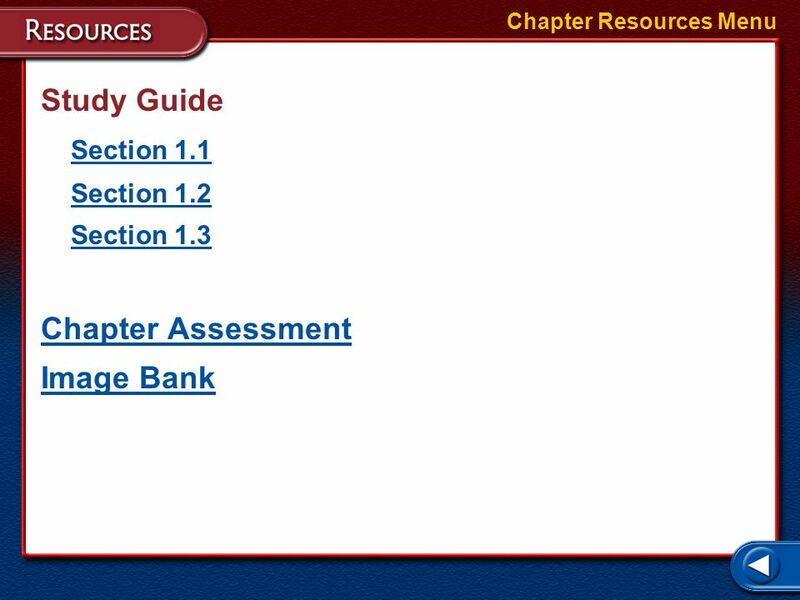 Chapter Assessment Multiple Choice 3. 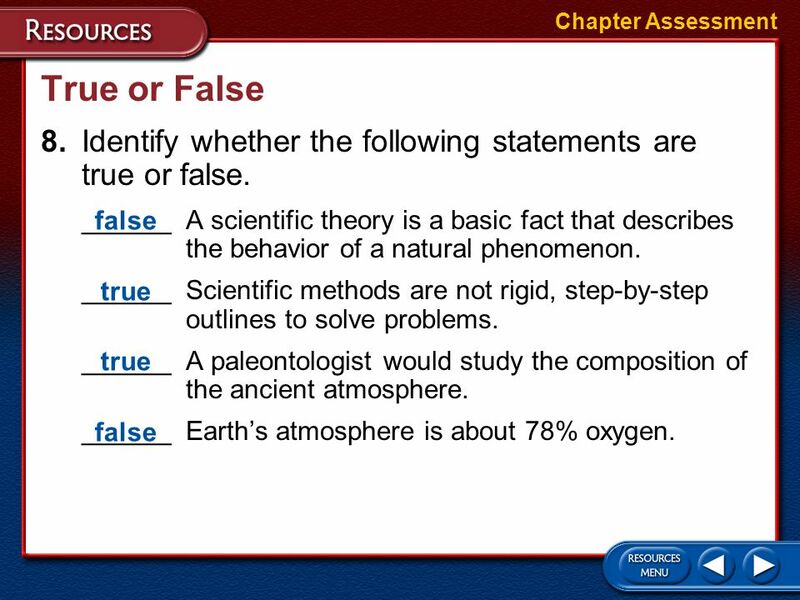 The asthenosphere is part of the _____. a.	lithosphere	c.	mantle b.	hydrosphere	d.	atmosphere The asthenosphere is the partially molten layer in the upper mantle. This is below the lithosphere which is the rigid outer shell of Earth. The hydrosphere is the water on the surface of Earth and in the atmosphere. The atmosphere is the blanket of gases surrounding Earth. 18 Chapter Assessment Multiple Choice 4. 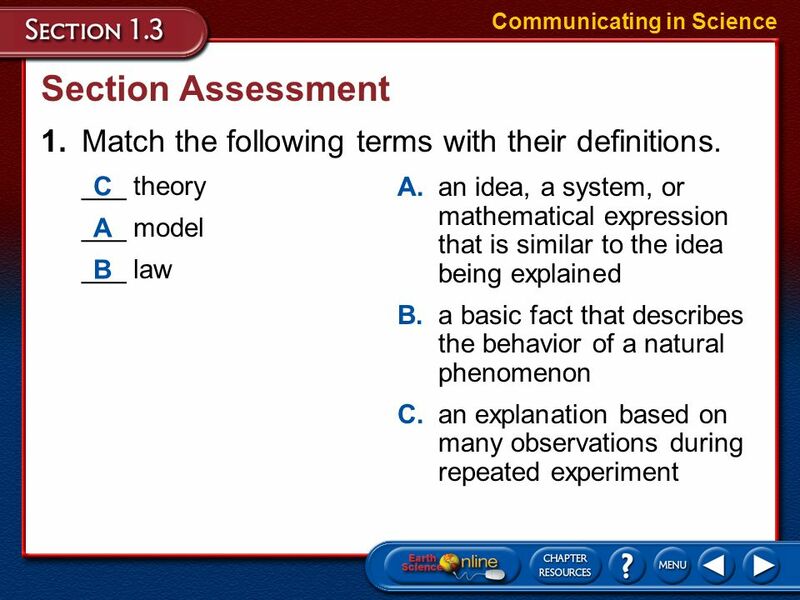 A(n) _____ is used in an experiment to show that the results of an experiment are actually a result of the condition being tested. 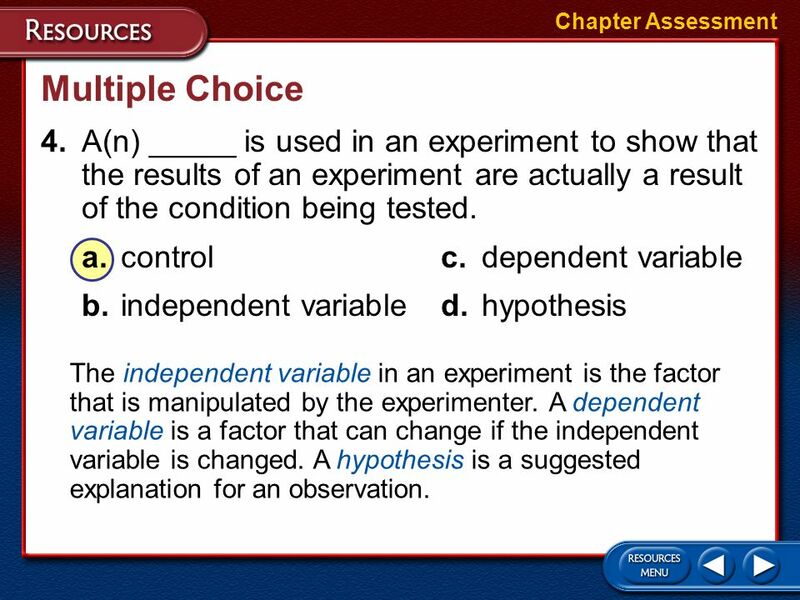 a.	control	c.	dependent variable b.	independent variable	d.	hypothesis The independent variable in an experiment is the factor that is manipulated by the experimenter. A dependent variable is a factor that can change if the independent variable is changed. A hypothesis is a suggested explanation for an observation. Chapter Assessment Multiple Choice 5. 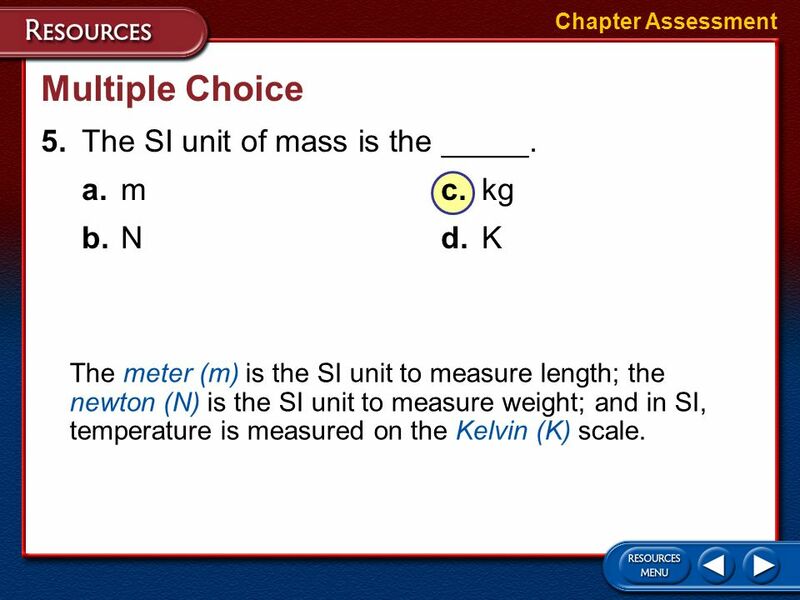 The SI unit of mass is the _____. a.	m	c.	kg b.	N	d.	K The meter (m) is the SI unit to measure length; the newton (N) is the SI unit to measure weight; and in SI, temperature is measured on the Kelvin (K) scale. 20 Chapter Assessment Short Answer 6. What are the four major steps and processes in the scientific approach to problem solving? 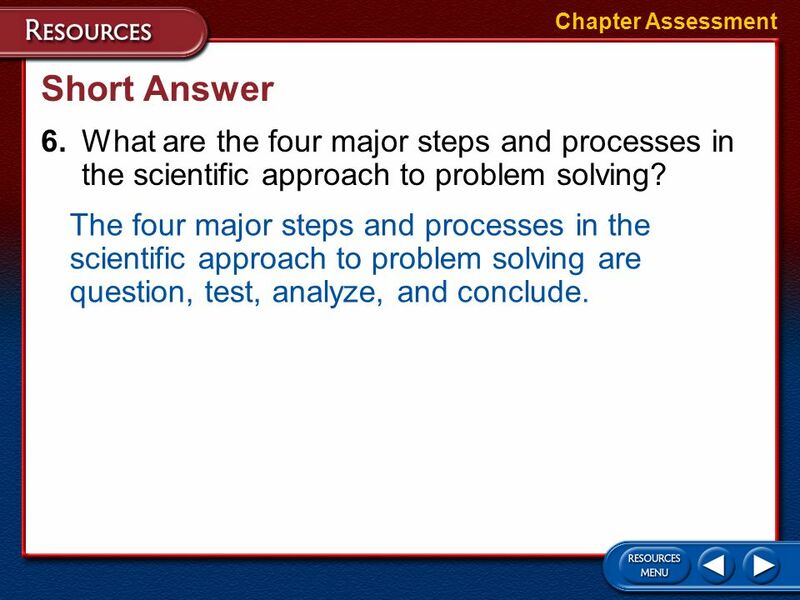 The four major steps and processes in the scientific approach to problem solving are question, test, analyze, and conclude. 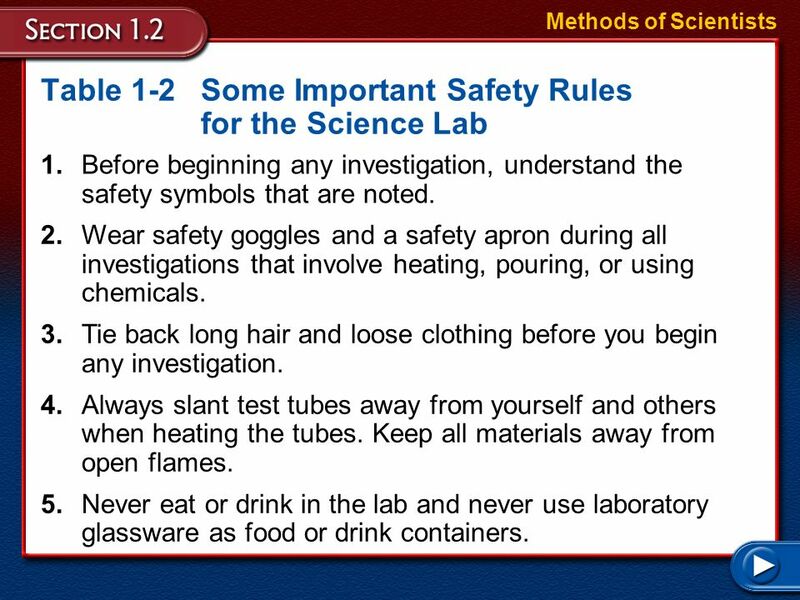 Methods of Scientists Table 1-2 Some Important Safety Rules for the Science Lab 1. Before beginning any investigation, understand the safety symbols that are noted. 2. Wear safety goggles and a safety apron during all investigations that involve heating, pouring, or using chemicals. 3. Tie back long hair and loose clothing before you begin any investigation. 4. Always slant test tubes away from yourself and others when heating the tubes. Keep all materials away from open flames. 5. Never eat or drink in the lab and never use laboratory glassware as food or drink containers. Methods of Scientists Table 1-2 Some Important Safety Rules for the Science Lab 6. 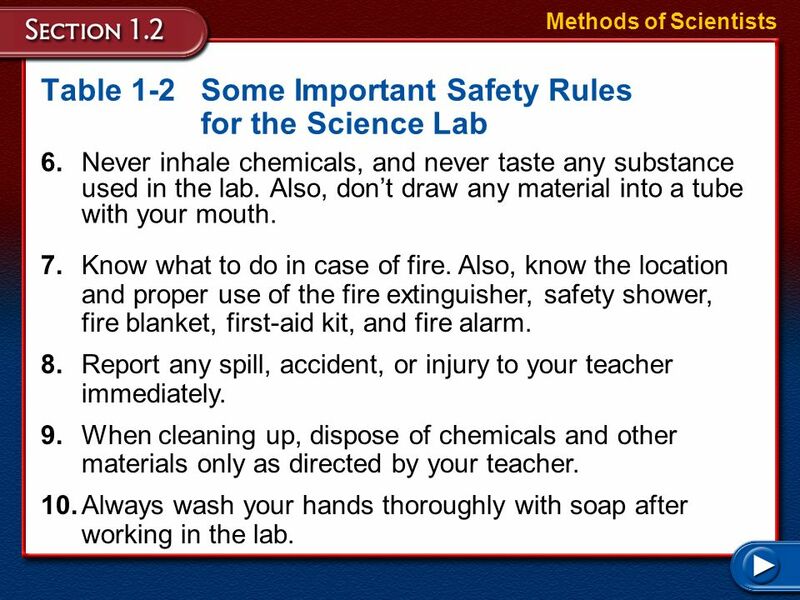 Never inhale chemicals, and never taste any substance used in the lab. Also, don’t draw any material into a tube with your mouth. 7. Know what to do in case of fire. Also, know the location and proper use of the fire extinguisher, safety shower, fire blanket, first-aid kit, and fire alarm. 8. Report any spill, accident, or injury to your teacher immediately. 9. When cleaning up, dispose of chemicals and other materials only as directed by your teacher. 10. Always wash your hands thoroughly with soap after working in the lab. 27 End of Custom Shows This slide is intentionally blank. 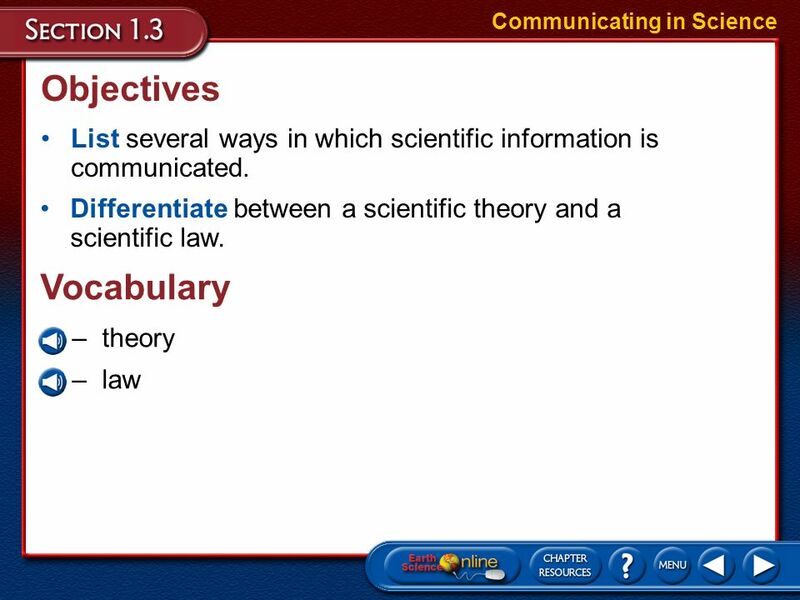 Objectives Vocabulary List the steps used in a scientific method. 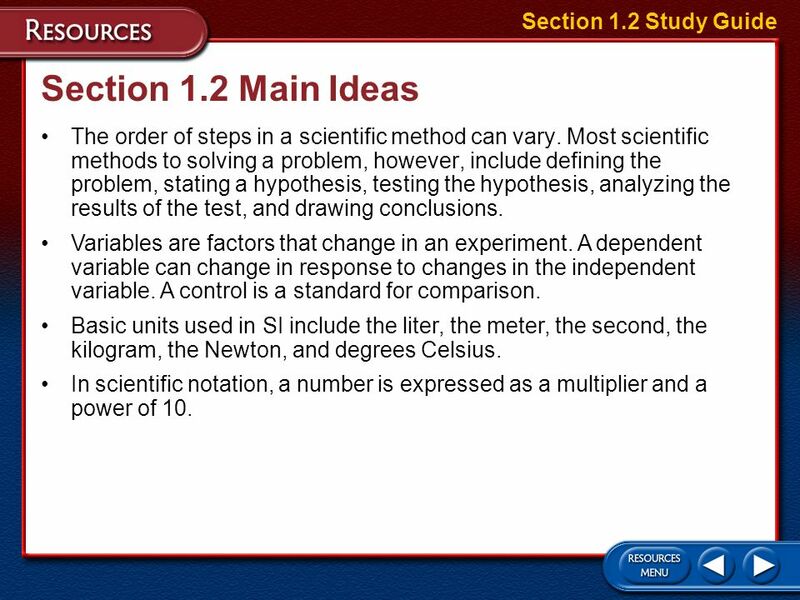 Chapter 1 Objectives Define science. Describe the branches of science. Ch. 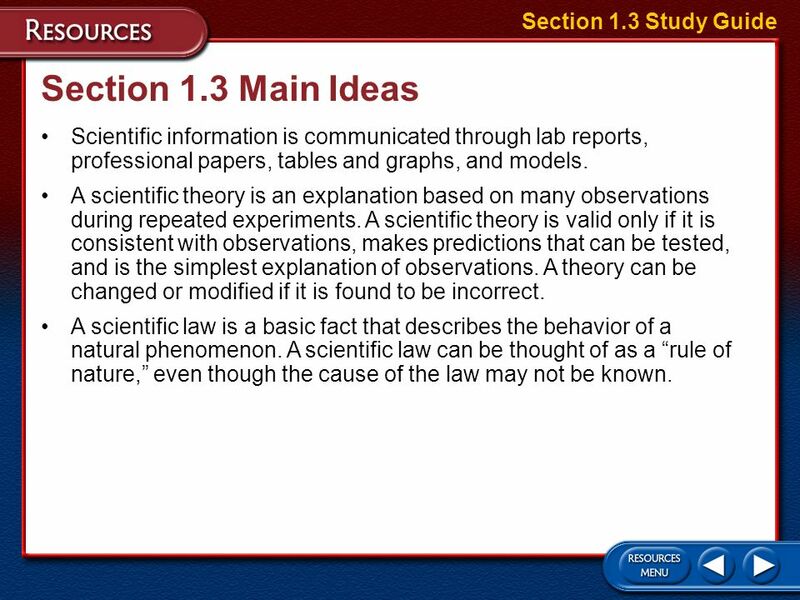 1 – The Nature of Science Discovery Lab – pg. 5 Branches of Earth Science –1. Astronomy (Define) Study of objects beyond Earth’s atmosphere –2. Meteorology. 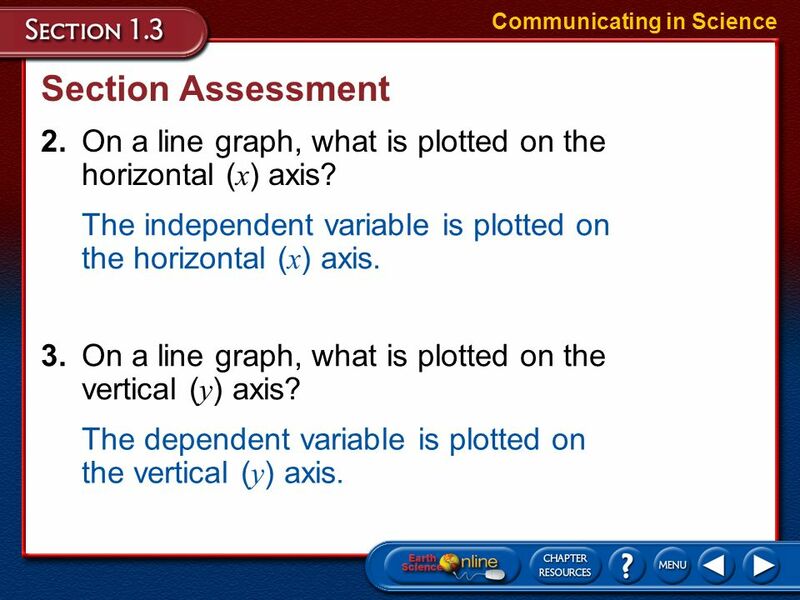 Objectives Compare and contrast independent and dependent variables. 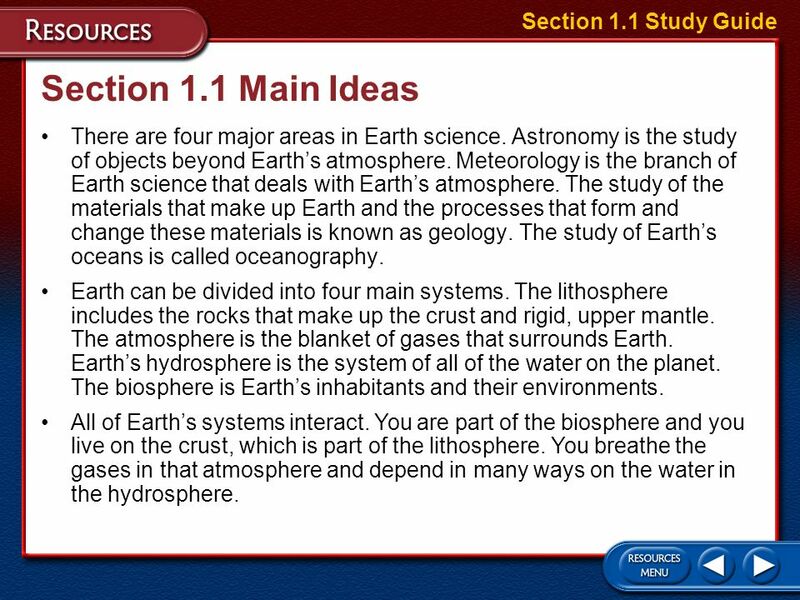 Introduction to Earth Science. 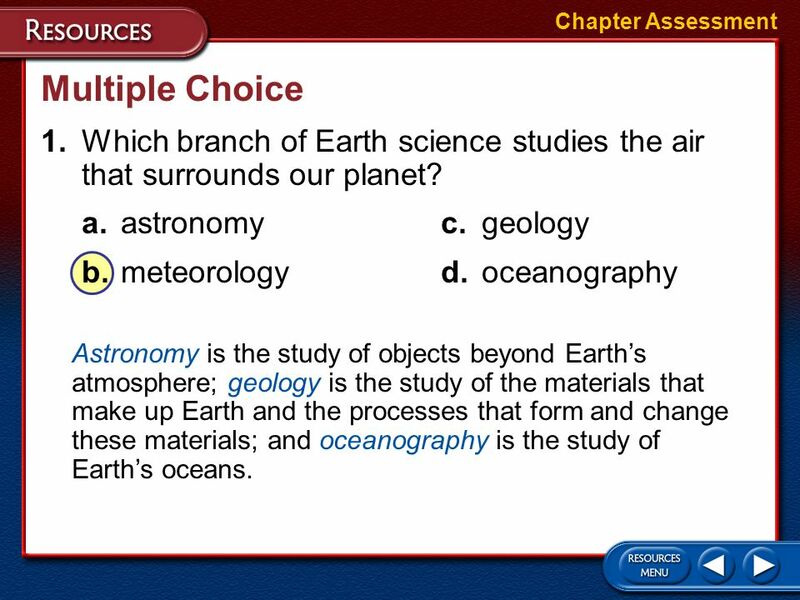 There are _____ major areas in Earth Science. __________ is the study of space. ____________ is the study of the Earth’s. 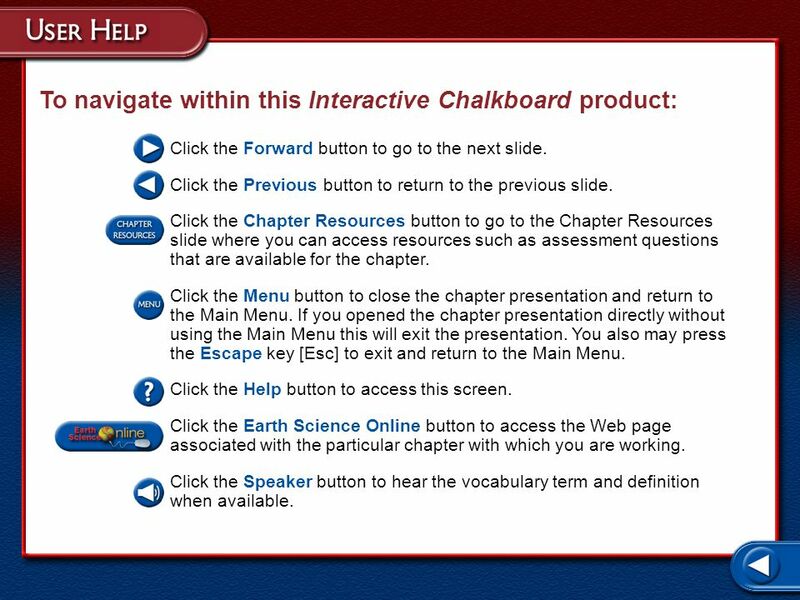 Guided Notes on Introduction to Science Pages 11-19 in Earth Science Book.